OSHA has very specific requirements for fall protection. Basically those standards are: 1) guard rail must be placed in any location where a fall of more than 6 ft. is possible, 2) the top height of railing must be at least 42″ tall, plus or minus 3″, 3) the railing must be able to withstand a minimum of 200 lbs. side and top loaded pressure with a maximum deflection of no more than 3″, 4) a mid rail or mesh panel must fill the space between the mounting surface and the top rail, 5) the top rail must be a minimum of .25″ diameter so as to not cut or abrade workers’ hands. For the complete OSHA requirements, go to: More OSHA Requirements. The standards for asset protection are much looser with critical factors focusing on employee protection, therefore many of the standards used in fall protection apply in asset protection. Areas you would want to protect might be pallet rack aisle ends, conveyors, pedestrian aisles, building walls, work stations, electrical/utility panels and controls, HVAC equipment, in-plant offices, and mezzanines. While many types of guard rail appear very similar, the primary differences are the grade of steel and other materials used in construction. That difference adds up to how many times the rail can withstand impact before deforming or damaging the anchor points and needing to be replaced. 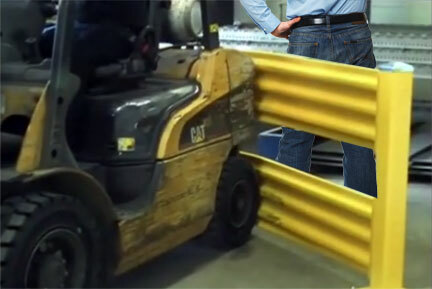 One advantage of the polymer based guard rail is the ability to deflect and dissipate the impact forces, leading to additional resiliency in the long run. All guard rail will fail if impacted enough times. What you want to consider is long-term cost efficiencies and risk factors for the particular locations you are installing guard rail at. Take a good look at the why of installing guard rail, the impact probabilities, and damage/injury risk you’re protecting against. Those should be your primary determinants in choosing a particular guard rail system. After all, achieving optimum safety is what you’re after, right?